Fly over Lake Amadeus and Kings Canyon before checking out Gosses Bluff on this 2-hour air tour from Ayers Rock by fixed-wing plane. 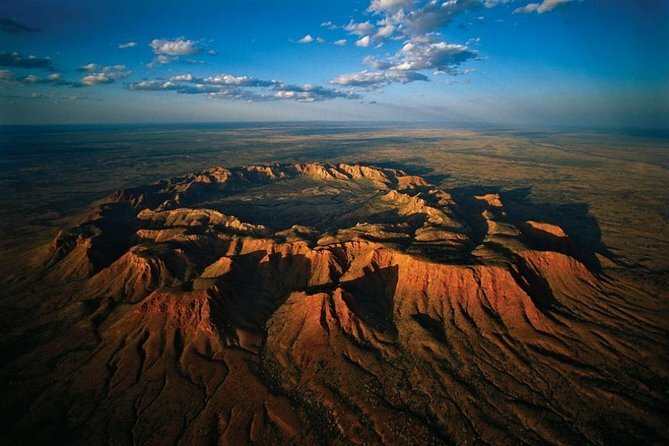 Thought to have been created by a meteorite that crashed into Earth about 140 million years ago, give or take, rugged Gosses Bluff surrounds a crater 3 miles (5 km) in diameter and 492 feet (150 meters) high. On the flight, enjoy a guaranteed window seat, and listen to commentary from the pilot along the way. Select a sunrise, morning, or afternoon tour when booking. Departing Ayers Rock Airport, your aerial adventure starts with a low-level pass along the inlet into Lake Amadeus. Your pilot flies at this low level so you can see the interesting patterns on the surface of the lake and the colors that make this one of the best sights in the area. Then climb up higher for a better view of the 112 miles (180 km) of the lake before departing for Kings Canyon. As you fly across the Australian outback, look out your window and try to appreciate its vastness. Approach the George Gill Range and the opening of Kings Canyon, lined with Ghost Gums, before your pilot circles over the canyon, pointing out the Lost City along the edge and the Garden of Eden waterhole inside the canyon. Continue your tour over George Gill and Middle Ranges, land that has been untouched for decades and is inaccessible by road. This is a sight seen by very few people, and the only way to truly appreciate it is from the air. You will circle the massive crater where the meteorite impacted Earth—the area of Gosses Bluff is known as Tnorala to the Western Arrernte Aboriginal people, and your pilot will tell you the story behind the origins of this natural site. On your way back to the airport, fly over Lake Amadeus again, and listen to more commentary from your pilot, who knows all about the area; feel free to ask any questions you may have. Your tour ends with return to your starting point.